Start by minimising the ribbon that runs along the top of the screen just below the menu bar where it says ‘File’, ‘Home’ and so on. You do this by clicking the small arrowhead to the top-right of the screen. You can still bring up the ribbon by clicking on one of the menu bar options, such as ‘Home’, but the ribbon will now disappear when you click back in the document area. Select ‘View’ on the menu bar and make sure your document is in ‘Draft’ mode. This stops it being interrupted by page breaks or headers or footers. Selecting ‘View’ again, un-tick ‘Ruler’ and tick ‘Navigation Pane’ in the ‘Show’ section. This results in a separate panel marked ‘Navigation’ appearing down the left-hand side of the screen. Go to the ‘File’ menu and select ‘Options’ to bring up the ‘Word Options’ panel. Select the ‘Proofing’ tab, un-tick ‘Mark grammar errors as you type’, and tick ‘Hide spelling errors in this document’. This stops those annoying red and blue wriggly lines from appearing as you write. While remaining in the ‘Word Options’ panel, select the ‘Advanced’ tab and scroll down to the the Display section where you can un-tick ‘Show horizontal scroll bar’. Then scroll down further and tick ‘Allow opening a document in Draft view’. As you can see from the screenshot above, the Navigation Pane serves to display the structure of your document in a manner similar to Scrivener. You can now structure your document using the ‘Heading’ styles that you find in the ‘Styles’ section of the ‘Home’ menu. Start with the headings ‘Manuscript’ and ‘Unplaced Scenes’ and set these to the style ‘Heading 1’. Then add the headings ‘Act I’, ‘Act II’ and ‘Act III’ and set these to ‘Heading 2’. Finally, add short descriptions of each scene and set these to ‘Heading 3’. Once you’ve done this you can re-order scenes simply by dragging them up and down the navigation pane, much as you would in Scrivener. I also find it useful to add notes to scenes that I have yet to write, reminding me what has to be done within the scene in order to drive the story on. This entry was posted in Writing and tagged Microsoft Word, Scrivener. Bookmark the permalink. I agree. I’ve written two long-ish novels using an old version of Word (and LibreOffice, switching the documents between computers via Dropbox), and find it more than adequate. I use a separate document for notes, timelines, to-dos etc and that’s OK too. 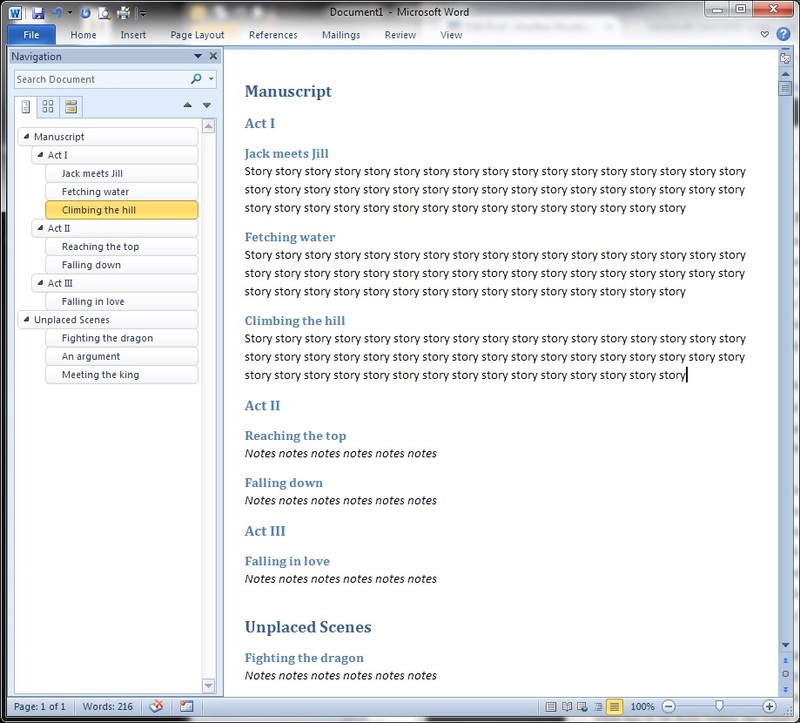 I tried Scrivener for Windows but found that the features got in the way of the writing, and for fiction it’s doubtful how much rearranging of scenes is needed anyway. I give each completed chapter a working title consisting of its word count and a one-line summary of the action (“2515: Mary interviews Michael at station”), so the Navigation Pane (called ‘Document Map’ in my old Word) becomes an instant synopsis. You can put the cursor in a heading, then through the Format menu choose ‘select all’, and copy all chapter headings to the clipboard. I then paste them into a new document, print them out and peruse them in the garden to see where I’m going wrong! Yes, and if you right-click one of the headings in the Navigation Pane then you can both select and print just that heading and its contents, which is great if you want to read through just one scene. When you make such changes does it change the default or is it possible to do it just for that document? Thanks. Thanks for your question, Karen! To answer, some of these settings are universal. Changes made to the View menu, for example, do ‘stick’ when you create a new document, but they are easy to reverse. On the other hand, some of the changes made through the Word Options panel remain specific to the current document. Remember too that you can save many aspects of your document, such as the fonts and weights used for your Heading styles, as a Template which then becomes available as an option when you create a new document.